Essex Prescott enrolled in Silver Mountain's race program at age 10. For many kids, dreaming about becoming a professional skier is just a dream. Not for Essex Prescott, who's turned his dream into a reality and is taking the skiing world by storm. Growing up in Coeur d'Alene, Essex spent every waking minute thinking about skiing. By age 10, Essex's parents Todd and Maryann, also avid ski enthusiasts, enrolled Essex in the Silver Mountain Ski Race program. It was here that Essex built a solid skiing foundation, thanks to the guidance and influence of his ski coach, Matt Wardner. "Matt knew that the fundamentals were important, but he taught us so much about everything that went into skiing," says Essex. "It was really awesome at that time, because it was a super-small program. It was all the same kids, and I had the same coaches the whole way through." One of Essex's fond memories of race training with this group was the after-training free-skiing sessions in which he and his teammates would participate: "We'd train in the morning, and then in the afternoon we'd have the craziest time on that mountain with all the race kids. I remember it felt like we ran that mountain into the ground." By Essex's early teens, he and his family relocated to Schweitzer Mountain Resort, where Essex became a member of the Schweitzer Alpine team. By age 15, Essex excelled at the Super G event, which is more focused on speed; in Super G, the gates are farther apart, allowing skiers to go faster. A typical race training day for Essex: "We would do speed training in the morning, and then we'd be spinning 360s in our speed suits and 210s in the terrain park later in the day." It was here, in Schweitzer's Stomping Grounds terrain park, that Essex met a new posse of freeriders who had the same passion as him; ripping laps in Schweitzer Bowl and launching huge airs in the park. This group — a mix of skiers and snowboarders, all with the same passion — called themselves the Soul Crew. A few of the Soul Crew members, including Noah Wallace and Pete Arneson, have gone off and made names for themselves in the ski world. "We were on a trip to Chile for a national development training camp, and I snuck a pair of my free-skiing skis in on that trip, like I always do. Down there I got to ski some fun, challenging stuff every afternoon. It was there that I realized this is something I really wanted to do on a higher level." With college on his mind, fascinated by the iconic Whistler/Blackcomb ski resort after watching a ski movie showcasing a couple of Whistler ski locals, Essex enrolled at the University of British Columbia in Vancouver. After all, they had a good business school and it was a short drive to Whistler, home to some of the world's greatest big-mountain free-skiers. During his first year at UBC, "I lived in Vancouver and drove to Whistler pretty much every weekend, where I'd sleep in my car," says Essex. "I stacked my classes up, so I only had classes on Tuesdays and Thursdays. I was in Whistler Friday, Saturday, Sunday and Monday, and I got pretty good at dirtbagging it by living in my car. There was a group of us that did it — we'd sleep in the parking garages. I was so blindly stoked on how amazing the mountain was." In his second year of college, Essex reversed the order and made an upgrade to his sleeping arrangements by sharing — make that cramming — into a little house with six other ski bums on the outskirts of Whistler: "We got a tiny place, and survived on Top Ramen and never turned the heating on; we were, like, huddled up, but it was fun." He would make the commute to UBC every Tuesday and Thursday for classes. 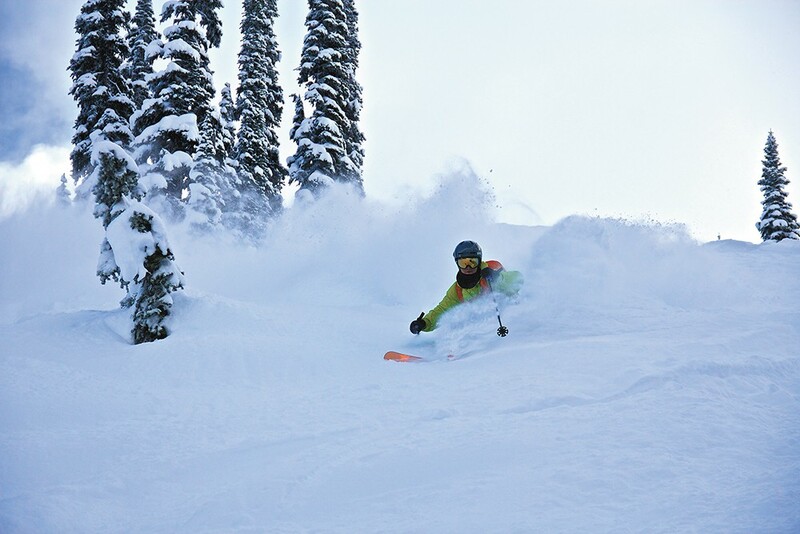 That was the year when skiing blew up for Essex; he met up with the right people, including several well-known big-mountain skiers like Nick McNutt, and several people who filmed skiers: "I was just, like, snowmobiling all the time, filming with these groups and going on trips, and going to school. It was crazy, and we filmed a ton." From that season's filming, Essex edited and entered his skiing segment into Teton Gravity Research's Co-Lab contest. His segment made it into the TGR Co-Lab movie; the resulting publicity resulted in his being invited to the World Heli Challenge in New Zealand. It was there that Essex realized he was making his ski dream a reality. Fast-forward a few years: Essex opened up a summer business and graduated from college, all while taking on the skiing world and fulfilling contractual exposure obligations for his sponsors, including Völkl skis and Marker bindings. His travels have brought him all over — Alaska, Japan, New Zealand, Montana and throughout British Columbia — filming segments for web series and production companies. His snowmobiling skills have improved out of necessity, as he spends much of his time accessing these backcountry locations on his sled. Snowmobiles make it easier to explore new terrain and to get up into the good stuff. In the offseason, Essex and two of his lifelong friends, brothers Corey and Gared Schneider, opened up the Buoy, a floating food truck on Lake Coeur d'Alene. This was the perfect business for someone who needs to shut down in the winter and focus wholeheartedly on skiing. Since the Buoy's introduction two years ago, he and his business partners have expanded, with two more locations on the lake: not a bad way to spend the offseason. With snow starting to cap Northwest mountaintops, Essex has hung up his apron, winterized the floating food trucks and focused on the upcoming winter. Once again, he'll be based in Whistler, where he'll work with filmmakers and photographers, getting the shots in backcountry locations. With a bright future in both the skiing and business worlds, who knows what's next for Essex? To keep up with Essex and his wild adventures, follow him on Instagram @essexprescott. Sat., April 27, 2-3 p.m.